The Puranas are invaluable and significant sources of Indian culture. The Pauranic tradition preserves Different aspects of Indian religious practices, philosophical musings, literary developments and cultural expressions. The development of the Puranas had been simultaneous with the development of Indian culture. They may be regarded as the ever-developing encyclopedia of Indian culture. Generally, the number of the Puranas is accepted to be eighteen, but the real position is that the number of the Puranas is much more than eighteen. The Puranas which are counted in the category of eighteen are called the Maha Puranas, but there is another category of the Puranas which are called the Upa-Puranas and their traditional number is again fixed as eighteen, though actually their number is much more than eighteen. The importance of these Upa-Puranas as sources of Indian culture is as much as that of the Maha-Puranas . The Sun-worship is an ancient tradition of Indian which originated in the Neolithic age and continued throughout history in some form or the other. Even at present, it is alive in some temples and in some rituals. Specially, the key mantra of the Hindus- the Gayatri is dedicated to the Sun-god as the prime source of life and the rituals of sasthi vrata is very popular. The names of the Upa-Puranas differ in many lists, but the Samba Purana finds mention in all these lists without exception which may be regarded as a strong argument in favour of the antiquity and popularity of this Upa-Purana. The Maga-oriented Sun-worship is the theme of the Samba Purana. It is well-known that in ancient times, the Sun-worship had been universally popular religion. In prehistoric times, natural form of the sun was worshipped through symbols. The Vedic tradition has a strong tradition of the sun-worshiped. In this tradition, the natural form of the sun was worshipped under various names-Surya, Savitr, Mitra, Visnu, Pusan, Asvin, Adityas etc. Sun-worship w as observed through various symbols. The present book is the first authentic edition of Samba Purana along with complete English translation, an exhaustive introduction, scholarly notes and an index of verses in the end. The Puranas are invaluable and significant sources of Indian culture. The Pauranic tradition preserves different aspects of India religious practices, philosophical musings, literary developments and cultural expressions. This fact may be accepted without doubt that the origin of the puranas was simultaneous with the Vedic tradition by the real form of the Purana literature came to be developed only in about third—fourth century B.C. The development of the Puranas had been simultaneous with the development of Indian culture. On one hand the Puranass conserve the old tradition; on the other hand they imbibe new elements also. They may be regarded as the ever-developing encyclopedia of Indian culture. They continued to develop from the third-fourth century B.C. to the fourteenth-fifteenth century A.D. or even later. They imbibed in this process different tradition, various sects and many cultural idioms. As such we may see beautiful panorama of history, politics, religion, and culture of India in this vast literature. Generally, the number of the Puranas is accepted to be eighteen but the real position is that the number of the Puranas is much more than eighteen. The Puranass which are counted in the category of eighteen are called the Maha Puranas, but there is another category of the Puranas which are called the Upa-Puranas and their traditional number is again fixed as eighteen, though actually their number is much more than eighteen. The importance of these Upa-Puranas as sources of Indian culture is as much as that of the Maha-Puranas. In certain sense their importance is much more than the Maha-Puranas resulting in too many interpolations while the Upa- Puranas, being less popular, absorbed lesser developments and hence lesser interpolations. The historical importance of the Upa-Puranas increase son account of this feature. It is a historical fallacy that such important sources of Indian culture have not been give their due. Two reasons may be cited for this neglect of the Upa-Puranas. Firstly, the Upa-Puranas are regarded as subordinate to the Naha-Puranas. Secondly, most of the Upa-Puranas have not been available in print form for a very long time and as such the scholarly world was not aware of their existence till quite recent times. Scholars take the word-‘Upa’ in the Upa-Puranas as indicative of ‘lowliness’ but we may most forget that the epithet ‘upa’ has another meaning i.e. ‘nearness’ as it is implicated in the case of the Upanisads. Five features (Pancalaksana) are characteristics of the Puranas which may be traced in the Maha-Puranas. However, later on, the number of features creased from five to ten. In this increased category, the discussions on religious sects became a prominent feature. This tendency became so dominant in later times that many other features came to be neglected and to describe some religious sect became prominent objective o some Puranas. The Upa-Puranas specially demonstrate this tendency. Consequently the Upa-Puranas became reflective of some religious sect. The traditional society did not give as much respect to the Upa-Puranas as accorded to the Maha-Puranas because the Upa-Puranas neglected Pancalaksana but on account of their popularity the society could not ignore them completely. They were branded as the Upa-puranas because these Purana are near akin to the Maha-Puranas are near akin to the Maha-Puranas. However, the significance of the Upa-Purana literature as the source of sects of Hinduism –sara ganapatya, Vaisnava and Sakti, cannot be minimized. The Sun- worship is an ancient tradition of India which originated in the Neolithic age and continued throughout history in some form or the other. Even at present, it is alive in some temples and in some rituals. Specially, the key mantra of the Hindus-the Gayatri sis dedicated to the Sun-god as the prime source of life and the ritual of sasthi vrata is very popular. Sun-worship has been enriched from time to time by different traditions-tribal as well as by the Aryan including foreign Iranian traditions. Surya-namskara is of great value in present day India. The pre-historic and proto-historic societies of Indian worshipped t he sun-god through various forms of symbols. The sun-gods in the Vedic tradition occupied important place when the natural form of the sun was worshipped by prayers and praises through the sacrifice (yajna). The different forms of the sun came to be adored under various names-Surya, Savitr, Visnu, Mitra, Pusan, Asvins, Adityas etc. The symbolic tradition of the Sun-worship continued to exist in the Vedic religion but the classical form of ht sun-cult came to be developed in the post. Vedic period when two new tendencies the indigenous Bakti ideology and the influx of the foreign Iranina tradition of the Magas had been responsible for the development of the classical sectarian form of eh sun-cult. The Mahabharata refers to the Saura sect along with other sects like Saiva, VAisnava, Sakti, Ganapatya etc. At that very time, there had been immigration of the Iranian Magi priests who worshipped the combined form of the sun and the Fire. It appears that these two tendencies were originally non Vedic . Indian tradition had been known for its tolerant, synthetic and all-absorbing trait. This trait led the India society to absorb and synthesize these various streams of the sun-worship-Vedic, non-Vedic, tribal and Iranian into a classical form by the5th century B.C. and its literary expression came to be incorporated in the Puiransa specially the Samba and the Bhavisy – the two Upa Puranas of different dates. 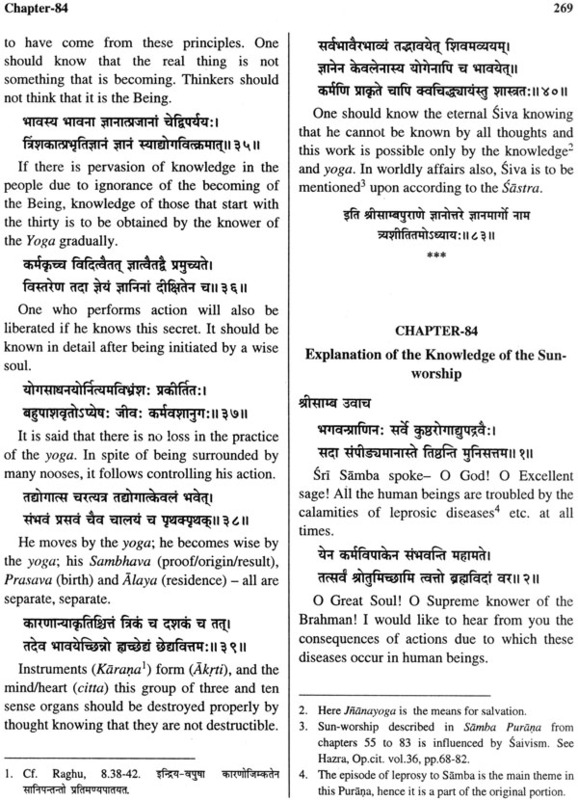 Eighteen Upa-Puranas are listed in different sources. The names of the Upa-Purana differ in many lists but the Samba Purana finds mention in all these lists without exception which may be regarded as a strong argument in the fanvour of antiquity and popularity of this Upa-Ourana. Sun-worship of classical form is mentioned in other Puanas such as Bhavisya, Varaha, Skanda, Markandeya, Agni etc. In addition, we get reference to a comprehensive Saura literaue, but unfortunately none of these named Puranas are available. Only the Samba Purana and Bhavisya Purana are available to us. Hazra appears to be justified in his assertion that the accounts of the sun-cult of Iranian Magian tradition as found in other Pranas appear to be borrowed ones and are interpolations form the Samba Purana. P.V. Kane has not accepted this view because the different portions of the Samba Purana have different dates and as the priority of the Samba Purana over the Bhavisya and Brahma puranas cannot be definitely determined. (1) The Matsya Purana (53.61) specially says that when the story of samba was incorporated in the Bhavisya Purana it was already included in the Samba Puran and he independent status of the Samba puran a was well established at that time. (2) The Varaha Puran a (ch. 177) refers to the fact that Samba made the Bhavisya Purana as new indicating that originally the Bahvisya Purana had no Samba episode in it and all matters related to the Samba episode were added in it later on. (3) Thirdly, the Bhavisy Puarana had originally a collection of only 14000 slokas in which the worship of Brahma was predominant. T he samba episode was not there in its original form. Later on, many episodes including that of Samba were added to it and the collection of the Bhavisy pruana became voluminous having one lakh slokas. It is to be noted that the Library of the Asiatic Society of Bengal had a manuscript of the Bhavisy a Purana which had five Paravas- Brahma, Vaisnava , Saiva, Tvasta, Pratisarga. This hand-written manuscript is much smaller than the published manuscript the Bhavisya Purana and had not reference to the Samba episode. 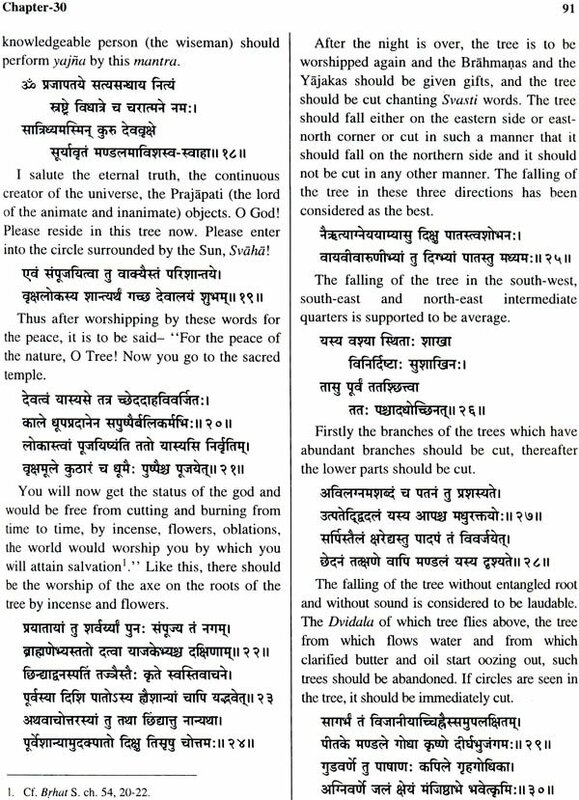 The Bhavisya Purana (I.93) appears to have borrowed slokas from chapter 38 of the Samba Purana. Both the Bhavisya and the Samba Puranas refer to dana in the Sun-worship. The episode of samjna is found at two places (ch. I.47 and ch. I. 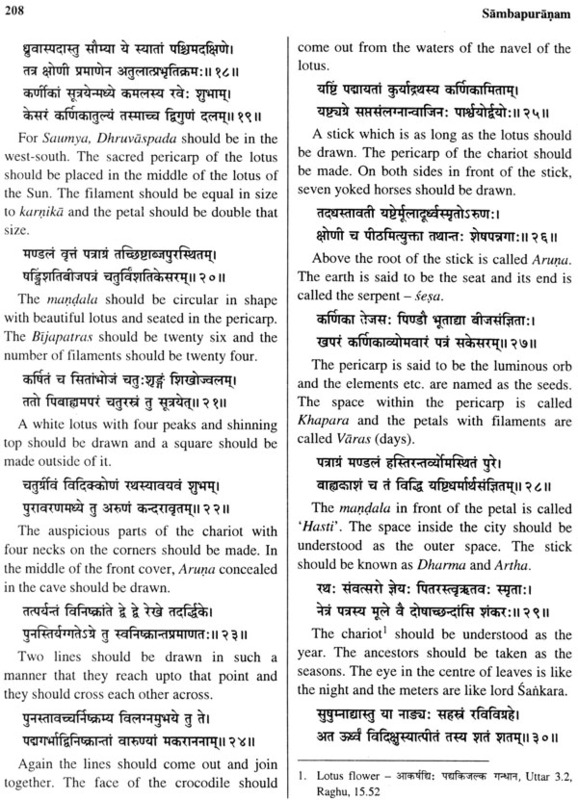 79) in the Bhavisy Purana and both differ from each other. Naturally two different versions of the same episode could not have been written by one and the same author. It is to be observed that the Samjna episode as motioned in the Bhavisy Purana (I.47) has similarities with that of the Samba Purana (10.10). We start getting slokas of the Samba Purana form I. 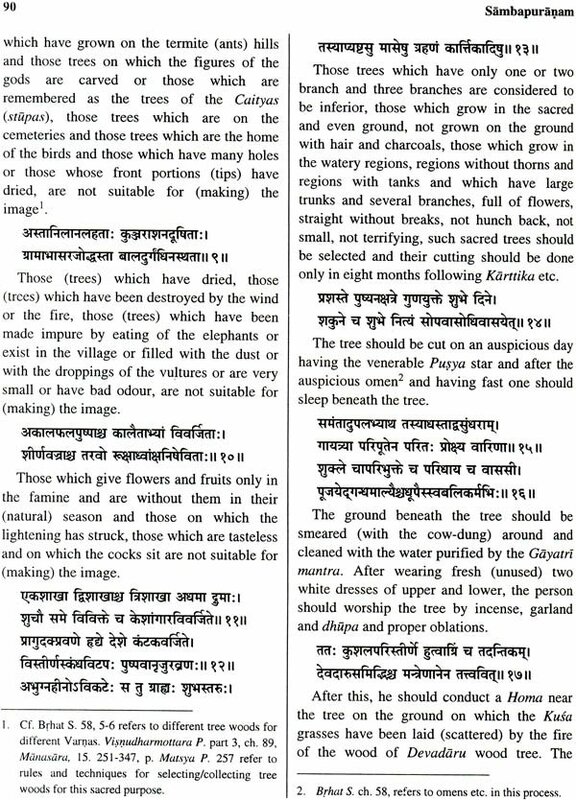 52 of the Bhavisy a Purana, which is actually continuation of I. 51 of the Bhavisy a Purana. Its narrator is Vasudeva who had been introduced for the first time in I. 48. The Bhavisya Purana had Tantrik influence on I. 48, & 49. The chapters I. 16, 18-21, 24-38 & 46 of the Samba Purana are free from Tantrik influence. Naturally it may be concluded that the chapters I. 51 and 52 of the Bhavisya Purana were incorporated later than the original part of the Samba Purana . 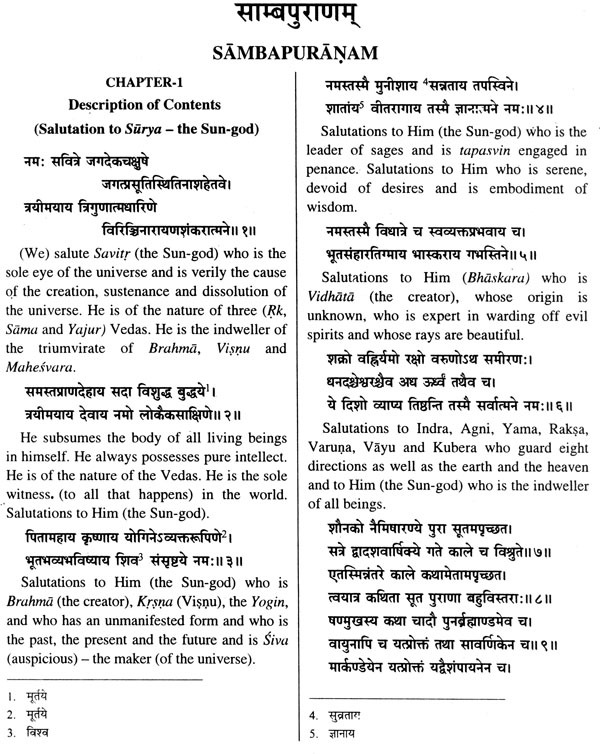 Many slokas of chapter 8 of the Samba purana are incorporated at three different places in the Bhavisya Purana which clearly show that the Samba Purana presents the origin of different names of the Sun god. 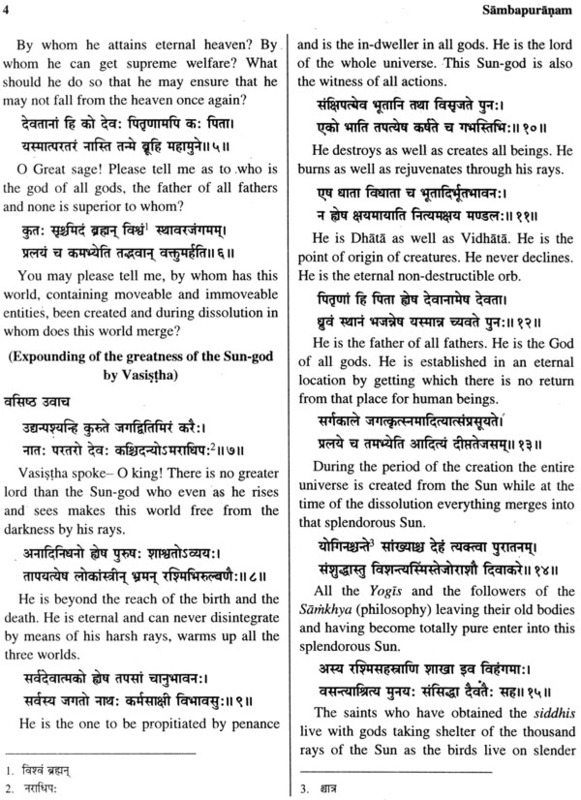 The bhavisya Pruana omits this origin of names of the sun god, though it has incorporated other material of this chapter. 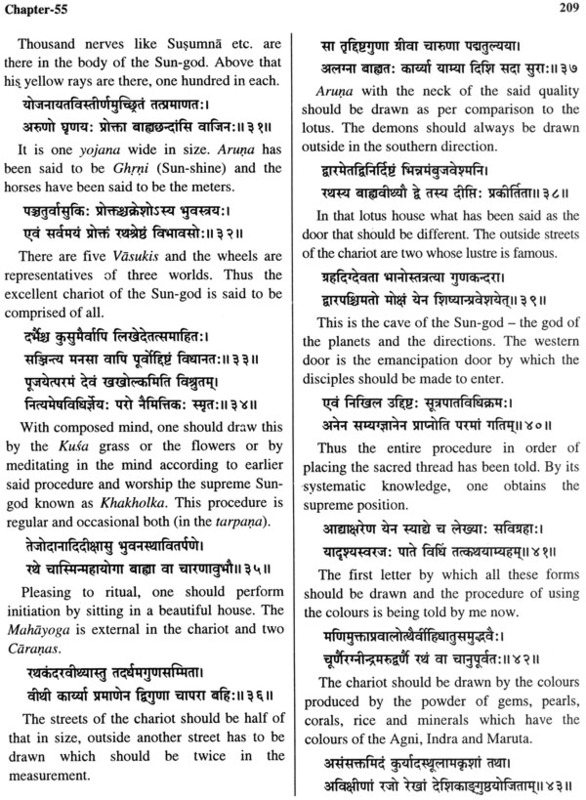 Many slokas of chapters 10 and 11 of the Samba Purana are incorporated in chapter the Samba Purana. On many other grounds, it may be asserted that the Bhavisya Purana had borrowed materials from the Samba Purana. 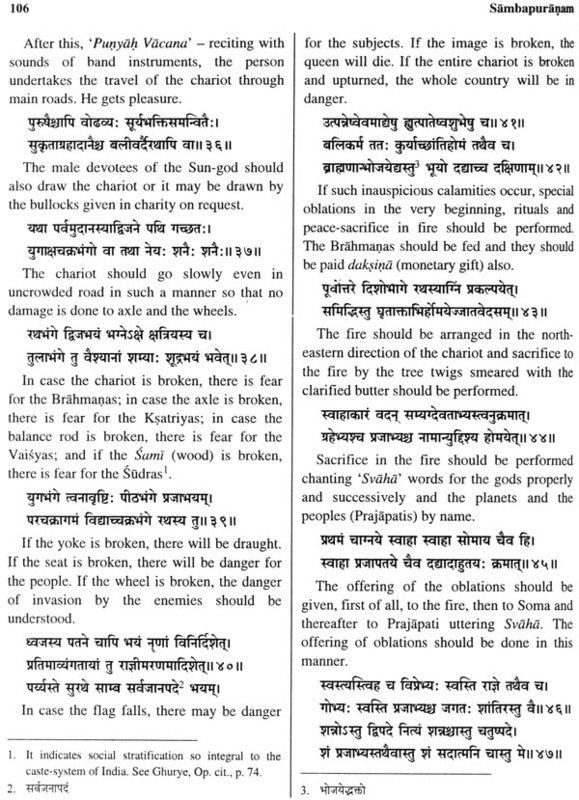 The Bhavisya Puran has borrowed many slokas from the Brhat Samhita but we do not get single line of the Samba Purana in the Brhat Samhita while the material from chapter 8 and 29-31 of the samba Purana are traceable in the Bhavisya Purana which show that the Bhavisya Purana borrowed the Samba episode form the Samba Prana and extended the chapter with the additions from the Brhat Samhita. We get a pointer to the Samba puran in the chapter I.66 in the Bhahvisy Puran. The episode of the advent of the Magas finds mention in three partsin I.1. 39 of the Bhavisya Purana. First and third parts are interconnected while the second parties totally different. The second part is not traceable in the Samba Purana while the first and third parts are available in the Samba Purana. Like the Bhavisya Purana, the Brahma Purana has many slokas which are common to the Samba Purana. Naturally the conclusion may be drawn of the bases of internal evidence that the Brahma Purana has borrowed these slokas from the samba Purana. We may take the Brahma Purana 29, The Samba Purana 38 and the Bhavisy a PUrana I.80 to 82 and 93. 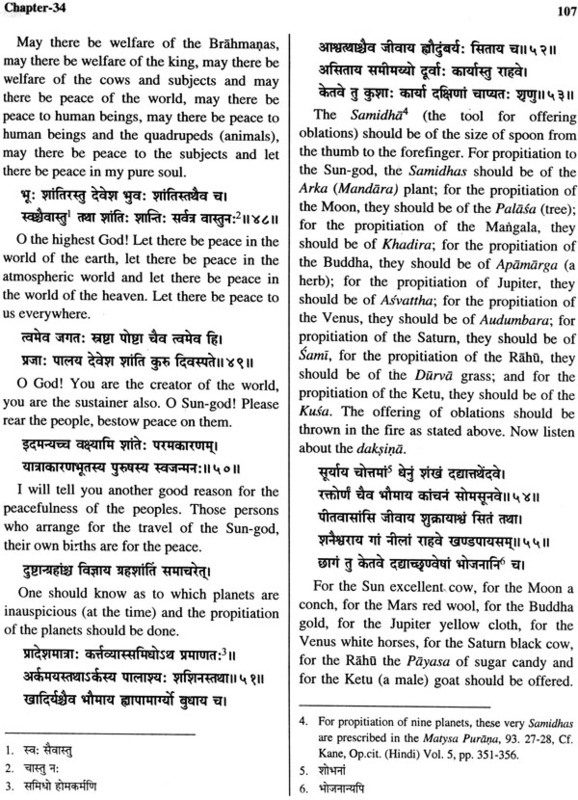 S similarly many slokas in the Prabhasa khanda of heskanda Purana appear to have been borrowed from the samba Purana. In view of above considerations, it may be asserted that the samba Purana had been the original work of the Magniniased Sun-cult. It is unfortunate that P.V. kane has not given any detailed arguments for not agreeing to the view of Hazra. Hazra has fixed the date-brackets of the Samba Purana which are generally accepted. In his opinion, the Samba Purana has different units from the point of views of date- brackets and due to interpolations, they used to be increased. It is neither a work of one date nor a product of one author. It has mainly two parts. The first part includes chapter I (excepting slokas 17-35), hapter2-15, 16, 18-21, 24-32, 34-38, 46 and 84. This is the original part of the Samba purana which was composed between 500-800 AD. Specially in its earlier time frame. In this part, we may include chapter 17, 20-23 also but its composition may be later than 950 AD. Cahpter33 was probably composed between 700-950 AD. Chapter 44-45 may have been composed between 900-1050 AD. The second part includes chapters 39-43, 47-83 whose date may be fixed between 1250-1500 AD. The second part has also many sub-units like 39-41, 42-43, 47-52, 53- 55 (upto sloka 1-97) and 55 (from sloka 98) and 83. Heinarich von stictencron has accepted the view of R.C. Hazra but he is of the opinion that the original part of the Samba Purana cannot be fixed later that the 5th century AD. The views of Hazra that the original part of the Samba Purana had more slokas which are not found now, may be accepted as probable. The first part of the samba Purana appears to have been compassed in Punjab while the later part seems to be the product of Orissa. This statement is supported by following arguments. The first part of the Samba Purana has been incorporated in the Bhaviya Purana while not a single sloka of the later part is traceable in the Bhavisya Purana . It clearly shows that these two parts were written at two different periods. The chapters of the first part were associated with Mitravana on Candrabhaga river whose location has been fixed in Punjab while the chapters of the second part are associated with Mitravana on the first part is called Mitravana while the second part calls the place of Sun-worship in chapters of the first part is called Mitravana while the second part calls the place of sun-worship as Tapovana, Surya Kanara, Ravi Ksetra nad Surya Ksetra. 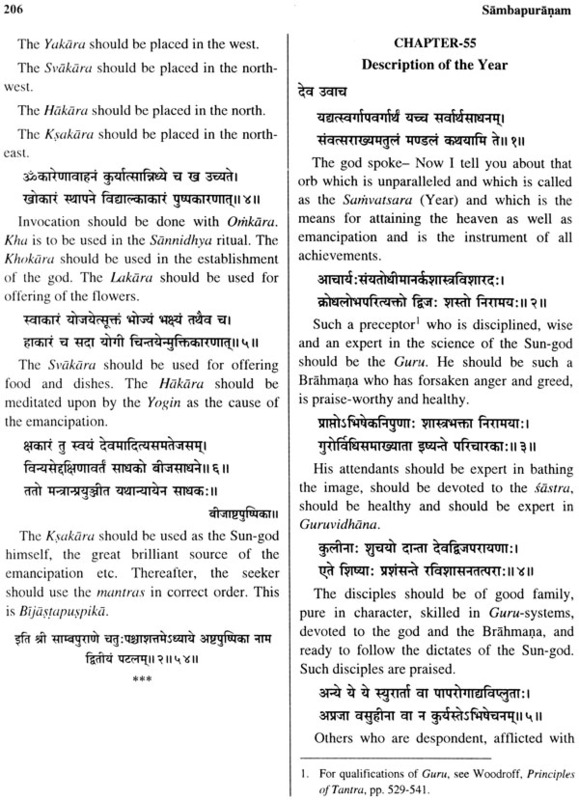 The Brahma Purana calls Konark as Ravi Ksetra, Surya Ksetra etc. The first part of the Samba Parana gives the credit of installing the image of the Sun god to Samba, while in the second part the people after seeing the sun-image in the ocean installed the sun image. The later account fits in with Konark. There are other differences also in the first and second parts of the Samba Purana. For example, the Vedas have been given highest honour in the first part while the second part is dominated by the Tantrik influence. Following manuscripts of the Samba Purana have been available. India office London Library has two manuscripts (J. Egglings catalogue nos. 3619 and 3620). Both these manuscripts are similar. They resemble the manuscripts of Asiatic Society, Calcutta and Sanskrit College, Calcutta. They resemble the Samba Purana published by Venkateshwara Press, Bombay. The only difference is in respect of chapters. The London manuscripts have only 70 chapters while the published Samba Purana (Venkateshwar Press, Bombay ) had 84 chapters. The published work has increased the chapters by bifurcating some chapters of the manuscript. For example, chapter one of the manuscript has been bifurcated into 1 and 2. Similarly, chapter 48 of the manuscript has been bifurcated into 48-52 chapters. In the manuscript the subject matter after chapter 48 has been divided into 22 sub-parts which are called Patala. Those have been called Jnottara. The last part of the manuscript is chapter 84 of the published work. 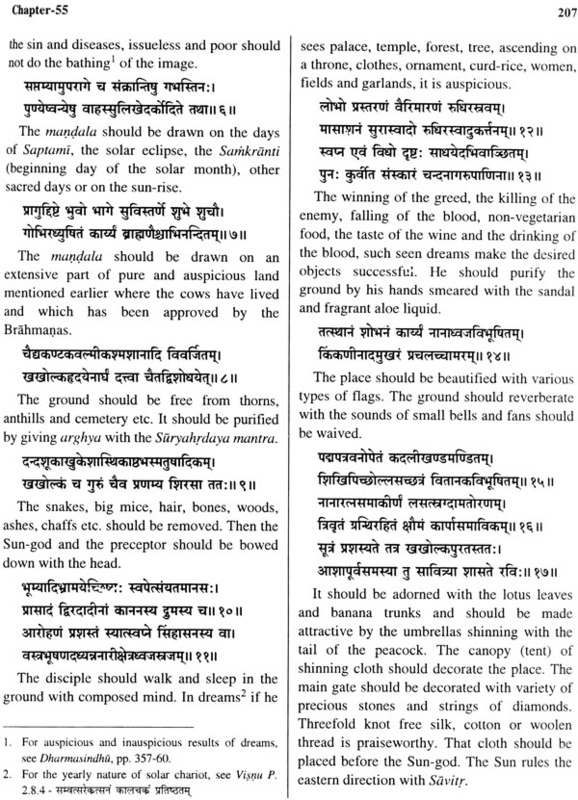 The last sloka is similar to that of Sanskrit College, Calcutta, manuscript. The Samba Purana has been repeatedly called Samba Purana in this manuscript. The manuscript no. 4093 of this Literary has 100 folios of 12' x 6' size. Each page has 13-14 lines. The script is Nagari. The date is Vikram Samvat 1930. This manuscript is only upto chapter 83. It resembles manuscript no. 3619 of India Office Catalogue. It begins with Timira Kirakiratah and ends with Etata Sarva Samakhyatam bhaskarena mahatmana Prccato mam sambohis punyena mahitale. Its author is Pt. Chitrasena Mishra. It ends with the following Puspikd : Iti sri samba purane sakadvipi dvijardra mahdtmyam noma saptamodhydhah. Valit s'akala bhogopdti lokam ca visnoh. This manuscript is full of errors and has no connection with Eggeling's Mss no. 3619. Sanskrit College, Benaras has also a manuscript of the Samba Purana. Gopinatha Kaviraja has given its description in his Catalogue. A few years back, Ganganatha Jha Kendriya Sanskrit Vidyapeeth, Allahabad has got a manuscript of the Samba Purana written by Pt. Nanda Singh. It was acquired from Pt. Baladeva of Brahmana Tola, Sahasram, Rohtas, Bihar. The date is Vikram Samvat 1897. There are 49 chapters and 2 patalas. The remaining matter has been included under Jiianottara.